A study by the Urban Institute has found that the big stock market crash of 2008 may not seriously impair retirement incomes if equity values recover halfway by 2017. In a computer simulation of a partial recovery in equity values, the overwhelming majority of people age 43 and older will have retirement incomes no less than they would have earned if there had been no crash at all in 2008. This surprising outcome is based on the assumption that workers did not sell their equity holdings during or after the crash, continue to make the same level of contributions to retirement plans, and continue to invest in equities at a level appropriate for their age. In spite of the losses from the stock market crash of 2008, the overwhelming majority of people age 43 and older are unlikely to see see lower retirement income than they would have received if there had been no stock market crash at all, according to a study by the Urban Institute in Washington, D.C. Given the one-third decline in the S&P500 index that occurred between December 2007 and December 2008, the projection is a pleasant surprise and far better outcome than most now expect. The Urban Institute’s projection comes from three alternative scenarios generated by its Dynamic Simulation of Income Model. The findings are published in an Older Americans’ Economic Security issue brief titled “How Will the Stock Market Collapse Affect Retirement Incomes?” by Barbara A. Butrica, Karen E. Smith and Eric J. Toder. During 2008, retirement accounts lost $2.8 trillion or 32 percent of their value, according to another Urban Institute report by Mauricio Soto that can be found at this link: http://www.urban.org/url.cfm?ID=901260. In addition, individuals also lost significant wealth in holdings outside their retirement savings accounts. The three scenarios simulate changes in equity values from 2007 to 2017. Each scenario is compared to one where there was no crash at all in 2008. One scenario assumes there is no rebound and that equities continue to earn a return of 5.5 percent a year (6.5 percent less a 1.0 percent administrative fee) from their depressed share price levels at the end of 2008. A second scenario assumes a full recovery of equities by 2017 to the level that the prevailed before the crash. The third scenario assumes that equities will recover by 2017 to a level about halfway between the scenario of no rebound and the full recovery scenario. The simulations do not take into account the potential effect of declines in bond and housing values on future retirement income. The simulations also assume that some people will have other earnings streams after age 67, including pensions and earnings from continued employment. Importantly, the simulations include projected incomes from Social Security. The fairly positive findings are also due partly to the fact 37 percent of Americans born between 1941 and 1965 did not own stocks when the market crashed and, thus, will have lost nothing in the stock market as a result of the crash. The report gives the outcomes from all three scenario simulations for middle boomers. If there is no stock rebound and stocks simply resume their 5.5 percent rate of price appreciation from their 2008 lows, then middle boomers will lose 9.9 percent of the retirement income compared to a no-crash scenario. If there is a partial rebound in equity values, middle boomers will lose only 3.8 percent over a no-crash scenario. However, if there is a full recovery in equity values by 2017, middle boomers will earn 2.8 percent more in retirement than they would have earned if there had not been a stock market crash. The brief explains why: "Some people will come out ahead if the market rebounds because higher returns on their new stock investments will more than make up for the 2008 loss in market value." "Even those who do nothing other than hold their existing stocks until the market recovers will see no change in their projected retirement incomes from the no-crash scenario," the report states. "But those who sell their stocks before the market can recover, will lose on their initial investments and will lose retirement income between the no-crash and the full-recovery scenarios," the report warns. The report does not give all three scenario outcomes for pre-boomers, only the partial recovery scenario. Not surprisingly, pre-boomers will suffer the most losses in retirement income compared to a no crash scenario because they have less time to recover from the crash. However, the loss to retirement income is not as great as one would expect under the partial recovery scenario. About 15 percent of pre-boomers – those in the quartile with the highest incomes – will have losses of 10 percent or more in retirement income. Another 29 percent will see 2 percent to 10 percent less income than they would have if there had been no crash. Surprisingly, 57 percent of pre-boomers will have no change or less than a 2 percent loss. These are pre-boomers in the lower two quartiles of income with few, if any, assets held in equities. Clearly, however, the pre-boomers who have accumulated the most toward retirement and have had significant investments in equities will see the biggest hit to income. Most of those born in 1941 and 1942 from this pre-boomer population segment were probably already retired in 2008 – so the impact on retirement income has already been felt. Given higher life expectancies, the pre-boomers can look to some rebound in income as their retirement years unfold, if they retain their pre-market-crash equity holdings and only reduce them gradually on an age-appropriate basis through 2017. Those farthest from retirement will fare the best, as one would expected. Again, however, the report gives the partial recovery scenario for this population segment. Only 2 percent of late boomers in the partial recovery scenario will have losses above 10 percent, compared to a no-crash scenario, while 15 percent will have losses between 2 percent and 10 percent. A very high 79 percent of late boomers will have no change or losses of less than 2 percent, while 4 percent will actually have gains over what would have been the case with no crash. The report underscores the importance of Social Security in the outcomes from the various simulations. The report warns that other factors may have a bigger effect on retirement income than any rebound in equity values. "Although the stock market collapse is likely to have small effects on most Americans' retirement incomes, the negative impact of the economic recession on retirement incomes may be larger and further reaching," the authors state. "Job layoffs, wage reductions, and wage freezes brought on by the current recession will affect future retirement income through Social Security and pension benefits," the report adds. One should also consider in what additional ways the scenario simulations may understate future income losses beyond the caveats contained in the report. For example, the authors do not state that the returns on equities may be lower in the coming years than the 5.5 percent historic trends assumed in these projections, especially if the recovery is short on job creation and if, as expected, consumers continue to increase their savings rates. Given sharply higher personal savings rates, which will reduce consumer spending, and a potential jobless recovery, equities may be hard-pressed to sustain returns based on historic trends. Further, the projection assumes there will be no cuts in Social Security benefits. Given the high level of deficit spending and raft of potential new spending programs that may significantly increase the deficit, the pressure to trim benefits could be quite strong in coming years. A YouTube video of a series of questions by Representative Alan Grayson directed at Federal Reserve Board Inspector General Elizabeth Coleman has garnered over 1.5 million viewings to date. The popularity of the video reflects both public frustration with holding the Fed accountable and the power of the Congressional star chamber to create a media sensation. In a nearly empty House hearing room, Rep. Alan Grayson, the Democrat representing the 8th District of Florida, asks Federal Reserve Board Inspector General Elizabeth Coleman a series of questions, which she is unable to answer to his satisfaction. Grayson posted the grilling on YouTube May 6 and the video has garnered 816,408 views so far. He reposted the exchange in a higher quality version May 12, which so far has garnered 696,292 viewings. Here is a link to the May 12 YouTube video: http://www.youtube.com/watch?v=cJqM2tFOxLQ&feature=channel as posted by Congressman Grayson. The comments on YouTube are overwhelmingly critical of Coleman's responses. Grayson, a member of the House Financial Services Committee, has taken up the cause of overseeing the expanded lending programs of the Federal Reserve since the collapse of Lehman Brothers in September 2008. Grayson begins by asking the I.G. if she has investigated the Fed's "role in deciding not to save Lehman Brothers, which led to shock waves that went through the entire financial system." "We do not currently have an investigation in that particular area," Coleman replies. Grayson asks if there is an ongoing "investigation" of the Fed's $1 trillion plus expansion of its balance sheet. Inspector General Coleman replies there is a "high level review" of the expanded lending facilities at the Fed to identify the risks involved, but says she is unable to provide Congressman Grayson with any details on what is being found. Grayson asks if Coleman has "reached any conclusions" about the Fed's lending programs and Coleman says she has not. When asked if she knows who has received the $1 trillion plus, Coleman replies: "I do not know. We have not looked at that specific area at this particular point in those reviews." Yet the $8.7 trillion dollars reported by Bloomberg are not all part of Fed programs. As Bloomberg authors Mark Pittman and Bob Ivry state: "The Federal Reserve, Treasury Department and Federal Deposit Insurance Corporation have lent or spent almost $3 trillion over the past two years and pledged up to $5.7 trillion more." Coleman replies that she has not seen the Bloomberg article and is not able to respond to the information it contains. Grayson again asks Coleman if the Fed has in fact engaged in $8.7 trillion of off-balance sheet transactions. This "works out to $30,000 for every single man, woman and child in the country. I'd like to know if you're not responsible for investigating that, then who is?" he asks. Coleman replies that the Fed does have responsibility in that area. Grayson asks: "Have you done any investigation or auditing of off-balance sheet transactions conducted by the Federal Reserve?" Coleman replies: "At this point we are conducting our lending facility project at a fairly high level and have not gotten to a specific level of detail to be in a position to respond to your question." In response to a question about whether or not any audits have found losses since the Fed began expanding its programs last September, Coleman says that "until we actually go out and gather the information, I'm not in a position to respond." She further adds that she "is not in a position to say if there are losses." An exasperated Grayson concludes, "I am shocked that no one at the Federal Reserve, including the Inspector General, is keeping track of this." The popularity of the YouTube video captures the frustration of the public with the expansion of government programs that appear to be a bailout of financial institutions and to lack sufficient justification, effective oversight and accountability. The public continues to want to know what is being done with all the lending, spending and loan guarantees, whether they are really needed, how they will be reined in, and what losses can be expected. There is also frustration with other federal programs, such as those used to bail out banks and auto companie. In the end, this popular video suggests that the public remains skeptical and deeply unhappy with Washington bureaucrats and politicians, who are at considerable risk if they do not do more to justify their emergency programs and make them fully accountable. It also shows that outrage without all the facts can cast anyone in an unfavorable light when, so far, we do not really know what the review will find. At this point, in all fairness, we should not pre-judge the Inspector General. In a joint hearing before the Department of Labor and the Securities and Exchange Commission, regulators questioned the make-up of target-date funds and the disclosures related to them. Such funds have been increasingly popular with plan sponsors -- as well as employees -- but even some with the same target date have widely divergent equity allocations. Closer scrutiny of target-date funds by the U.S. Department of Labor and the Securities and Exchange Commission is likely to prompt new regulatory initiatives by both government agencies. A lengthy day-long joint DOL-SEC hearing on June 18 highlighted a number of issues facing employers that include target-date funds as options in company-sponsored plans, especially when the target-date funds are designated as a default investment. Fed Governor Elizabeth Duke took a look at recent key credit market indicators and compared them to credit declines in past recessions to measure the impact of the Fed's 'credit easing' policies. She found that, except for home mortgages, credit declines in this downturn have not been as severe as in past recessions. Further, the decline in home mortgages is not particularly large in comparison to declines in some credit markets in the past. Given the severity of the current financial crisis, this is an “early indication” that the Fed’s policies have been “broadly successful in relieving stresses in the key credit markets,” according to the Fed Governor. Duke, who joined the Federal Reserve’s Board of Governors last August on the eve of the financial meltdown in September, gave her early analysis of the impact of Fed policies on credit availability at the annual meeting of Women in Housing and Finance June 15 in Washington, D.C. Despite her reassurances that the Fed’s activities do not amount to quantitative easing, some market analysts continue to view them as such. Duke offered a brief tutorial. “Quantitative easing can be thought of as an expansion of the central bank’s balance sheet with no intentional change in its composition,” she stated. “That is, the central bank undertakes more open market operations with the objective of expanding bank reserve balances, which the banking system should then use to make new loans and buy additional securities,” Duke saud. Duke then explained why quantitative easing is not the appropriate policy to address the crisis that erupted after the failure of Lehman Brothers last September. “[W]hen credit spreads are very wide, as they are at present, and the credit markets are quite dysfunctional, it becomes less likely that new loans and additional securities will result from increasing bank reserve balances” – that is, will result from quantitative easing. Credit easing is different because it “focuses on the mix of loans and securities that the central bank holds as assets on its balance sheet as a means to reduce credit spreads and improve the functioning of private credit markets,” Duke said. Note: Figures in this story are taken from the online copy of Governor Duke's speech. See link at the end of story. 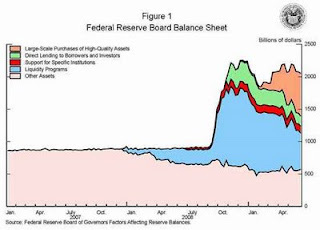 According to the June report, as of May 27, 2009, the Fed had $2.082 trillion in assets on its balance sheet, a $1.176 trillion increase over the level on May 28, 2008. Governor Duke divided the Fed’s credit easing efforts into four categories and provided a color coded chart to show how the Fed’s balance sheet has grown with reference to each category, as shown in Figure 1 above. The red category includes the first so-called Maiden Lane transaction in March 2008 to extend support to facilitate the merger of Bear Stearns and JPMorgan Chase. It also includes loans and facilities to support American International Group (AIG), first rescued in September 2008. The blue category includes a number of facilities to provide liquidity to “severely disrupted” interbank funding markets, as well as repurchase (or repo) markets for securities other than Treasuries, according to Duke. In this program the Fed has the Term Auction Facility, which expanded the range of programs through which it can lend to depository institutions. Two other blue programs -- The Fed’s Term Securities Lending Facilities and the Primary Dealer Credit Facility -- provide liquidity to primary dealers, Duke explained, to enable markets to buy, sell and issue securities. This program is aimed at reducing stress in repo markets for securities other than Treasuries, importantly mortgage-backed securities. Duke noted that these blue programs have been successful in narrowing of spreads between agency (Fannie Mae and Freddie Mac) and mortgage-backed securities, on the one hand, with Treasury general collateral repo rates, on the other hand. (See Figure 3.) Again, the Fed governor cited diminished use of this program is another mark of its success. In the green category, credit-easing policies have been targeted at improving conditions in commercial paper, asset-backed securities (ABS) and commercial mortgage-backed securities (CMBS). One money market mutual fund broke the buck in the aftermath of the failure of Lehman Brothers, a well-publicized event that led to a run on money market funds. 3. The Money Market Investor Funding Facility. These three facilities sought to improve the functioning of the commercial paper markets and help money market funds navigate through the volatility that was overtaking the markets. 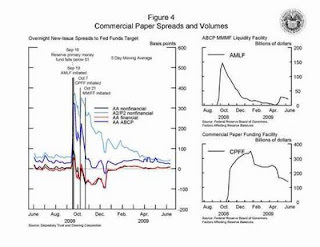 Duke pointed out that commercial paper conditions have improved markedly since the programs were launched and spreads have narrowed sharply. (See Figure 4.) As the spreads narrowed, again use of these facilities also declined. The Term Auction Lending Facility (TALF), another green program, is a joint effort of the Fed and the Treasury to improve credit availability by providing loans to investors to finance their acquisition of ABS and CMBS. The program was in response to the shutdown of these markets last fall. The program began with newly-issued ABS backed by consumer and small business loans. Recently, the program was expanded to include newly-issued and legacy CMBS. Conditions for ABS markets “have improved notably since the beginning of the year,” Duke said. Similarly, CMBS markets have more recently improved. Spreads on triple-A rated consumer ABS have narrowed 70 to 80 percent since they peaked in December, Duke noted. Spreads on CMBS have also narrowed, but remain “well above” year ago levels, according to the Fed governor. The “real story of TALF is new issuance,” Duke said. (See Figure 5.) 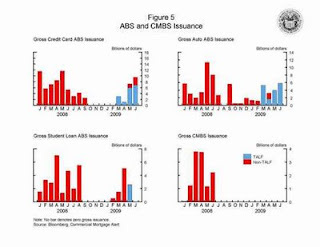 While the program started off slow it has gained momentum in May and June and overall ABS issuance has returned to levels near what they were before the markets collapsed. Furthermore, the Fed governor explained, there have been some ABS issues outside of TALF. The orange program is the largest of the credit easing efforts at $1.75 trillion of potential new assets on the Fed's balance sheets. The Fed committed to potential purchases of $1.25 trillion in agency MBS, up to $200 billion of agency debt, plus up to $300 billion of Treasury securities by the fall. It is this program that has garnered the most skepticism in some quarters, sparking fears of renewed inflation. The Fed has, in fact, slowed down its purchases in response to market concerns. Here Governor Duke expressed more caution. “The program appears to be having its intended effect,” she said. Yields on mortgages relative to yields on Treasuries have come down. (See Figure 6.) There has been a decline of about 1.25 percentage points in the spread between 30-year fixed rate mortgages and 5-year constant maturity Treasury rates since the program began in November. 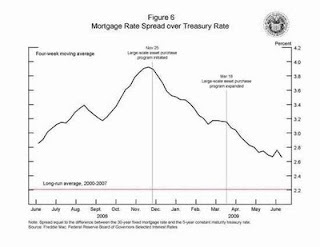 In recent weeks, however, Treasury rates and mortgage rates have risen, a fact that Duke acknowledged but did not explain in her speech. Duke also summarized other efforts made by Washington regulators, sometimes in conjunction with the Fed. One is the $200 billion Capital Purchase Program that came out of TARP (Toxic Asset Relief Program) funds and which has expanded the capital base of the largest banks and many smaller banks through direct capital injections from the federal government in return for preferred shares. 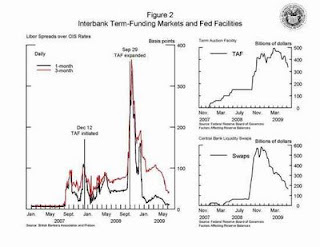 As well, the Fed Governor itemized the various FDIC programs that also bolstered the financial system: The temporary raising of the deposit insurance limit from $100,000 to $250,000, the temporary full coverage of non-interest-bearing deposit transaction accounts (Temporary Account Guarantee Program), and newly-issued senior unsecured debt of banks, thrifts and certain holding companies (Temporary Liquidity Guarantee Program). 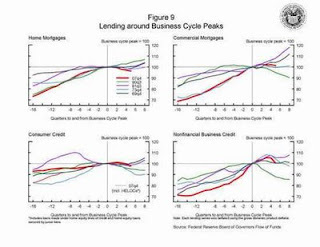 Duke compared the “evolution of credit” in home mortgages, commercial mortgages, consumer credit and nonfinancial business credit in the current and past business cycle downturns. She measured data for four quarters officially designated as recessions by the National Bureau of Economic Research in the period from 1952 to 2008. (See Figure 7). 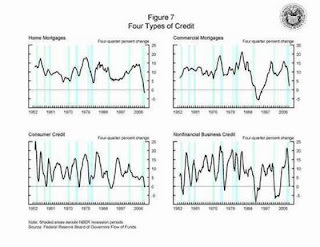 Using data from the Fed’s Flow of Funds reports, Duke noted that while home mortgage credit expanded in prior recessions, this is the first recession in the post-war period during which home mortgage credit declined. The current decline in the availability of home mortgage credit is similar to the one for commercial mortgages in the 1990-1991 recession, Duke noted. Duke made further comparisons in Figure 8 and Figure 9. Further, the current decline in home lending is not as great as the declines in some credit markets in the 1990-1991 recession. 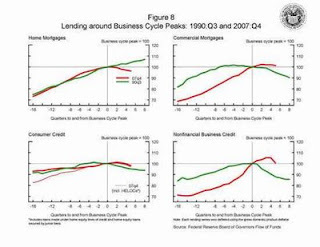 In addition, the current path of lending for credit markets other than home mortgages is more benign that in some past recessions. 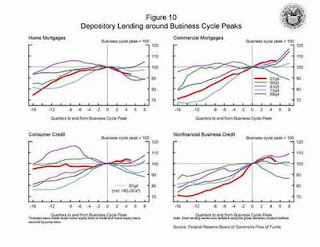 Duke argued that the greater decline in credit availability in the commercial mortgage market in the 1990-1991 recession “could be thought of as a possible scenario for lending in the current downturn in the absence of any policy response.” That is to say, without the Fed’s substantial credit-easing policies “the likely path of lending in the current downturn . . . would have been notably more contractionary than the 1990-1991 recession, given that the earlier episode – while characterized by a financial crisis – did not face as extreme an episode as the one experienced last September,” Duke stated. Duke’s conclusion: the Fed’s credit easing programs “have been broadly successful in relieving stresses in the key markets.” Given the severity of the crisis, the result is “a surprising but reassuring early indication that the combined policies have been successful at shoring up credit despite these events." Note: In the online text of Governor Duke's speech, the part of Figure 1 that represents Large Scale Purchases of High-Quality Assets is described as being "pink." It clearly is not. The area that is actually pink is the area at the bottom, which is part of the figure that represents "Other Assets." In this story, the writer has refrained from using the word "pink" to describe the category identified as Large Scale Purchases of High-Quality Assets in order to avoid confusion to the reader. He has, instead, described the color for Large Scale Purchases of High-Quality Assets as orange even though it is not exactly orange, but is close enough for the average viewer to identify that part of the figure. The Economist online today called for abolishing current retirement schemes and starting over. In support, George Magnus argued that current schemes are unsustainable. Opposing, Christian Weller contended that the current system can be put right if we have the will to do it. Voters so far have given the proposal a resounding online victory. This house believes that retirement in its current form should be abolished. With that proposition, intended to shock the reader and prompt debate, The Economist, the bright and brassy British weekly, this morning launched a lively online discussion about the design, cost, security and sustainability of current Social Security and other private and public retirement schemes around the world. From the launch of the debate, the 'yes' choice had a supermajority of total votes. By the end of the day (Tuesday), support for the proposal stood at 86 percent. Opposition, at 14 percent. In a format The Economist has successfully employed to promote lively, constructive debate in the blogosphere on a variety of issues, two experts were chosen to start off the discussion with opening statements. The man who made the proposal -- George Magnus, senior economic adviser at UBS Investment Bank in London -- presented his reasoning for advocating the abolition of the current system. In his statement, Magnus said that the expected increase in the share of the population that will be dependent on the working age population will be so large that current systems cannot find the resources pay out the benefits from future workers. The opposing case was made by Christian Weller, senior fellow, Center for American Progress in Washington, D.C., and professor of public policy at the University of Massachusetts in Boston. He contended that society had the wealth to shore up the system which only needs a little "tweaking," as The Economist moderator Barbara Beck put it. By the end of the day, there were 46 comments about the opening statements, many serious, some thoughtful, some flippant. A respondent with the screen name "tmoln" captured the somber resignation that was found in many posts: "Financial security is not assured no matter how 'cognitively advanced' one may be (with the implication one can successfully predict the future) or how many social support structures may be in place." Magnus's key recommendation is to have people work longer, if they wish, and to end all mandatory retirement ages. If people work longer, it means they reduce the time they are in the dependent sector of the economy, they spend more time contributing to retirement schemes and less time taking funds from them and, at the same time, improve the overall economic prospects of countries facing shortfalls in old age benefits, Magnus stated. "People will simply have to become more financially self-reliant, notwithstanding that up to half of people surveyed in several [Organization for Economic Cooperation and Development (OECD)] countries report currently [that] they are not saving at all or not saving enough for retirement," Magnus wrote. In his argument, Weller largely discounted the demographic issue by pointing out that the dependency ratio of people over 64 or below 20 was 0.7 percent in 2008. In 1950, it was also at 0.7 percent. So, what's the big problem? Weller wrote: "It's easy to lose sight of some fundamental facts in the middle of this financial and economic tsunami, but the truth is that we can still afford retirement. It is a matter of willingness to pay for retirement, not of the ability to do so." Weller asserted that the "three-legged stool -- public pensions, employer pensions and personal savings -- is still the bedrock of retirement income security. It is just that all parts of the three-legged stool have become very wobbly, and tightening them again can ultimately support a dignified retirement for all workers." The strong support shown for abolishing the current system and starting over signals serious dissatisfaction and disillusionment, at least in some quarters, with all retirement schemes, public and private. No doubt the economic and financial crisis that spread around the globe last year is fueling skepticism about retirement schemes. Part of this is due to the losses in funded schemes. And, part is due to the huge deficits that are being created now in reaction to the current economic and financial crisis, making the task of funding future shortfalls in pay-as-you-go schemes more challenging. Many people now expect bigger cuts in public schemes in the wake of current and near-term rising deficits -- no matter what politicians are saying. True, as Weller suggested, the demographic argument may not be as compelling in the United States in terms of Social Security, partly because the shortfall is more manageable in a country with a more modest benefit and a replacement fertility rate. However, the demographic argument cannot be so easily dismissed in most Western nations, Japan and China -- nearly all of which face serious challenges and engender serious doubts shared by most observers about their sustainability of their systems. While funded schemes and personal responsibility for retirement have been the drumbeat since the early 1990s in many countries, the downside of investing in financial markets has been made abundantly clear with two huge crashes in equity values: one in 2000 and the other in 2008. In mixed systems, wherein some of the retirement benefit is pre-funded and some is pay-as-you-go, the risks are diversified. But, as we have seen, both approaches can bring disappointing results at the same time. Pre-funded assets can face significant losses at times that may be critical for retirees. The rising deficits also raise another specter: that those who build up an accumulation of funds for retirement could see their value decimated if nations decide to inflate their way out of their mounting debts. The argument for working longer -- regardless of whether you favor tweaking the current system or a radical overhaul -- is the most compelling argument for the reasons enumerated by George Magnus. There is also here an argument for accumulating far more assets than one expects to need in retirement and to curtail current consumption as a bulwark against longevity risk and the possibility that one will not be able to work beyond a certain age. As well, an individual might want to allocate some of his or her accumulated funds in commodities or real assets that would protect one against inflation, too. Whatever one decides about how to prepare for retirement, it seems that it has become much more difficult to achieve retirement security. A New Era of Household Thrift? American households have dramatically turned away from years of rising spending and borrowing to embrace a new ethic of thrift and saving. This change of heart appears likely to continue for many years, which suggests the United States will have a weaker economic recovery than has been seen after other post-war recessions. While painful in the short term, this return of thrift will be beneficial in the long run. Whatever history’s ultimate conclusion about the current economic downturn, it has already earned its place in the record books on several accounts. We have the highest unemployment rate in 25 years at 9.4 percent. We have lost 5.4 million jobs. Housing prices have declined the most since the Great Depression. More national debt has already been created during this downturn than in any previous one – with the potential of new deficit spending beyond all that has spent throughout American history. The Federal Reserve has more than doubled its balance sheet to its highest level ever, $2.08 trillion, with the potential to go much higher. (A year ago the Fed's balance sheet was $906 billion.) Legendary Wall Street firms have vanished. A huge slice of the shadow banking system – the part not backed by government guarantees – has collapsed. The banking system is loaded with trillions of dollars of toxic assets. The government owns a major share of Citigroup, nearly all of AIG, the world’s largest insurance company, plus a controlling interest in GM and Chrysler. We are increasingly dependent on China to buy our debt, and around the globe, the dollar is frequently under attack. How do you get your arms around all that and make it relevant to your own life? If you feel intimidated, you’re in good company. Remember that virtually the entire economics profession here and abroad and nearly every financial journalist around the globe failed to see the financial meltdown coming. Two economists who did – Nouriel Roubini (New York University Stern School of Business) and Robert Shiller (Yale University) – were ignored. As was investment strategist Peter Schiff (Euro Pacific Capital, Darien, Connecticut). Analysts, strategists and economists spent nearly two years of trying to determine what went wrong and what should be done about it since the mortgage meltdown in August 2007 launched the crisis that has led to a deep recession. Given their track record, you can probably assume that the same people who didn’t see it coming do not yet fully understand the significance of all that has happened. They still have their “informed” opinions; and, while we can give them a hearing, I doubt that their views are more likely to be on target or more helpful than our own views based on a common sense understanding of basic human nature and the hard realities of household finances. Let's face it. Households, despite some missteps by those who borrowed too much, have shown themselves to be much better at managing their financial affairs than the federal government, the Fed, and virtually all financial institutions. Households, for example, cannot long delay the cold realities of budgetary imbalances or serious financial miscalculations. So, casting aside all caution, here’s my two cents worth on the economy and, of course, feel free to take it with a large grain of salt. First, where are we today? The pace of economic decline has slowed dramatically. Importantly, the pace of decline in home prices has slowed and home sales have turned up, as first-time homebuyers and investors snap up foreclosed properties on the lower end. However, a sharp rise in interest rates over the past few weeks means that continued progress in turning around the housing sector is likely to slow. A recovery in housing prices is critical to the effort to put a cap on the mounting losses in mortgages, mortgage-backed securities and their exotic and toxic derivatives held by banks and other financial institutions. To the extent that those losses are contained, banks and credit markets can expand better to meet demand and the recovery can proceed. Yet, even if the housing sector rebounds, do not expect a normal recovery. The reason? Our of necessity, the central player in our economy – the American consumer – has rediscovered the virtue of thrift. And because of this fundamental change of heart and spending habits, the economic recovery that could begin any time between now and early next year is likely to be weak by historic post-war standards. Let me explain why. Americans have been living beyond their means for so long they can no longer continue to do so. The march of American households deeper and deeper into debt has gone on almost continuously for nearly 50 years. In 1960, for example, that ratio of household debt to personal disposable income stood at a financially healthy, if not frugal, 55 percent. The parents of baby boomers who headed households at that time grew up in the Great Depression, during which the imperative to be thrifty was deeply imbedded in their psyches. By the early 1980s, the ratio of household debt to personal disposable income had risen to 65 percent – still respectable and manageable. However, over the 1990s debt levels soared as more global funds flowed into the United States to support lending to the American consumer; and, financial innovations made it easier for consumers to borrow as much as they wanted to borrow, often without regard to their ability to repay. By 2002 the ratio of household debt to disposable personal income had reached 100 percent. As the housing bubble grew ever larger, the ratio of debt to income balooned to 133 percent in 2007. Since 2007, households have started to pay down their debt and gradually increase their savings rate, which has moved from virtually zero to 3.9 percent in the first quarter of 2009. It is likely headed higher. As a result of these changes, in the first quarter of 2009, the ratio of household debt to disposable personal income had already moved down to 128 percent. (This ratio is reached by dividing $13.795 billion in debt from the Fed's Flow of Funds report by $10.785 trillion in disposable income from the Bureau of Economic Analysis's National and Income Product accounts tables). How long with this deleveraging go on? Based on historic patterns, a recent “economic letter” by Reuven Glick and Kevin Lansing of the San Francisco Fed hypothesized that household deleveraging could take anywhere from three years to a decade or longer. The authors said it might, for example, take until 2018 for households to lower their leverage to a debt-to-income ratio of 100 percent. What this suggests is that the current thrifty attitude is not just a temporary statistical glitch but a fundamental change. It is time for us to seriously consider whether or not the era of rising household debt is over and the era of declining household debt has begun. Earlier this week bond king Bill Gross of PIMCO described the reversal of direction in household finances this way: “The old slogan of ‘shop ’til you drop’ is being replaced by ‘save to the grave.’"
If this is our future, the demand for credit by consumers is unlikely to expand very much, even with a growing population. And the American consumer, whose activity has for decades been the engine of economic growth, may not be the powerhouse that has driven 70 percent of the economy. At the same time the process of getting rid of those bad assets is also likely to take a long time to unwind, in spite of all the programs developed to move them off the balance sheets of lenders. As a result, even credit worthy consumers and businesses are unable to obtain credit. And the shadow banking system that was once an economic powerhouse to meet consumer borrowing demand is likely to come back as only a shadow of its former self. We are living today in a Minsky moment. That’s the phrase coined by PIMCO executive Paul McCulley in 1998 during the Asian debt crisis to describe the point when the debt crisis broke. McCulley’s “Minsky moment” is so named because it is derived from the thinking of economist Hyman Minsky, who created a debt model he dubbed the Financial Instability Hypothesis. Minsky’s theory goes like this: in good times people and businesses are overcome by euphoria and build up debt beyond their ability to repay out of their income and profits. Once the debt level reaches its peak and households and businesses start to fail, it leads to a financial crisis and a severe economic downturn. The moment of truth is the Minsky moment. And we have now seen perhaps the biggest Minsky moment in our lifetimes. Of course, not all economists subscribe to a dour view of the future. Some believe the intrepid American consumer will come roaring back and the economy will take off again. The optimists argue that it is quite possible that the recovery, when it begins, will be the typical V-shaped recovery where we bounce back quickly. They point out that the sharp decline in the economy came from the credit market meltdown and the threat of a worldwide panic, but now that Armageddon has been taken off the table, the optimists contend, the bounce will be strong. Yet, the majority view, for what it’s worth, still contends we will have an L-shaped recovery, during unemployment will remain high for years and gains in wages will be modest. If the weak recovery scenario turns out to be our future reality, it need not be viewed as a negative. While painful in the short term, in the long run, the newly rediscovered virtue of thrift and debt reduction will pay off for households, the economy and society at large. As we manage our lives as independent writers, we can continue to make headway toward our career and financial goals. We will need to be more flexible and ready to consider new ways of thinking. Opportunities will appear in unlikely places and we need to be prepared to recognize them, seek them out and take advantage of them. The Department of Labor and the Securities and Exchange Commission will hold a joint one-day hearing June 18 to explore issues that have been raised about target-date funds or life-cycle funds. These are funds that allocate assets into a mix of stocks and bonds based on the age of the investor, with higher equity allocations for younger investors. The poor performance of these funds in the market crash has raised issues about their appropriateness in employer-sponsored retirement saving plans. The Department of Labor gave its regulatory blessing to target-date or life-cycle funds in the fall of 2007 at the peak of the market, giving employers the green light to offer these funds to employees who had not made a choice among the investment options in an employer's 401(k) plan. Target-date funds allocate the assets in the fund among stocks, bonds and other investment options to represent a risk level appropriate for the investor, based on the investor's age. The basic concept behind such funds is that the share of money invested in equities should be highest for young people and lowest for people near retirement in order to obtain the best overall returns and to protect gains as one nears retirement. Conversely, the share of bonds should be lowest for young people and highest for people near retirement. Further, sharp contractions in the value of equities, such as occurred after the burst of the dot.com bubble in 2000 and the market meltdown that followed the failure of Lehman Brothers in September 2008, lead to sharp losses that can take many years to recover. Despite the promise of target-date funds, the early evidence indicates that they fared very poorly during 2008, especially the 2010 funds -- which are funds designed for people only two years away from retirement. Heavy losses in these funds mean that investors have little time to make up the losses. To be sure, one would be hard pressed to find any investment approach that fared well during the market meltdown of 2008, except broadly shorting the market and betting against mortgage-backed securities, Wall Street firms and banks -- all strategies that would not be available to most employees in their employer-based 401(k) plans and other retirement saving plans. Financial adviser Chris Tobe describes target-date funds as "a distastrous choice for participants in 2008" in an article posted to this writer's Web site at: http://www.robertstoweengland.com/documents/Chris%20Tobe_OffTarget.pdf. Tobe currently does consulting work for Breidenbach Capital Consulting and is a trustee for the Kentucky Retirement Systems LLC in Louisville. Tobe compares the comparative abysmal performance seen in official data from Fidelity Investments and the Thrift Savings Plan, which is the retirement savings plan for federal civilian employees. The losses in the 2010 funds are, of course, the most troubling, since retirement for these investors was theoretically only two years away last year. Fidelity's 2010 funds declined 25.32 percent, while the Thrift Savings Plan's 2010 funds declined 10.53 percent. Even pure income funds with no equities did not do well in the 2008 crash. Fidelity's income funds fell 12.14 percent, while the Thrift Savings Plan's income funds fell 5.09 percent. "In fact, the huge variation in the amount of stock that goes into different fund companies' target-date recipes has experts wondering whether the names of the funds should change to reflect their level of risk," Aschkenasy writes. She cites a recent study by Financial Research Corporation in Boston that equity allocations in 2020 funds can range from 51 percent to 90 percent. Last year the Senate Aging Committee has looked into target-date funds under Chairman Herb Kohl (D-Wisconsin) and likewise found "a wide variety of objectives, portfolio composition and risk within the same-year target-date funds." Copeland found that as of 2007, the equity allocation ranged from about 80 to 90 percent for 2040 funds. For 2010 funds the range was from 26 to 66 percent -- a startling 40 percentage point difference. "This analysis finds that the relative rank of the equity allocation within a target-date fund does not appear to affect the percentage of participants investing all their account into that fund. Nevertheless, investors in specific fund families are more likely to invest all their assets in a single target-date fund from that family," Copeland writes. "A plan participant’s asset allocation is the most important determinant when assessing return. More than 90 percent of the variability of returns associated with a portfolio is determined not by buying and selling securities or trying to time the market, but through the power of asset allocation," the report claims. The clear message to investors is to learn more about a given target-date fund before deciding to invest in it. One cannot take comfort in the fact it is a target-date fund, given that there are no hard definitions about the asset allocation or level of risk. Tobe also warns employers that the "DoL emphasized that the selection of default investment option must be prudent." It will be interesting to see what sort of testimony will be given at the upcoming joint hearing on these funds by the Department of Labor and the Securities and Exchange Commission. The hearing will be available via webcast on the DoL's Web site at http://frwebgate.access.gpo.gov/cgi-bin/leaving.cgi?from=leavingFR.html&log=linklog&to=http://www.dol.gov/ebsa and on the SEC Web site at http://frwebgate.access.gpo.gov/cgi-bin/leaving.cgi?from=leavingFR.html&log=linklog&to=http://www.sec.gov. Federal Reserve Chairman Ben Bernanke today told Congress that the central bank has no plans to monetize the sharply rising deficits of the United States and defended the Fed's program to purchase Treasuries. He told Congress of the need for Washington to control spending and set appropriate tax levels, in consultation with the American people, to achieve 'fiscal sustainability' in the long term. By that he meant a situation where the ratio of government debt service to the size of the economy is stable or declining. In his appearance before Congress today Federal Reserve Board Chairman Ben Bernanke responded directly to mounting worries about sharply rising budget deficits in the United States, amid growing concern among major international investors in U.S. Treasuries, from China to Saudi Arabia, that the Fed might monetize those deficits. If the Fed were to monetize the debt issued to cover most of the rising deficits, it could lead to inflation and potentially sharp losses in the value of the dollar and, thus, the value of investments in U.S. Treasuries. In response to a question on monetizing debt, Bernanke stated: "The Federal Reserve will not monetize its debt." Bernanke further defended the Fed's plans to buy $300 billion in Treasuries on April 3. "I think it's important to point out that notwithstanding our purchase of Treasuries as part of a program to strengthen private credit markets, even when we complete the $300 billion purchase that we have committed to, we will still hold less Treasuries, a smaller volume of Treasuries, than we had before the crisis began." Through the Fed's open market program it is frequently a market player that purchases or sells Treasuries to achieve interest rate targets for the Federal funds rate. Bernanke did not address growing speculation that the Fed will expand its $300 billion Treasury purchase program, which might have the opposite effect intended and lead to higher Treasury and mortgage rates. Low mortgage rates, in particular are critical to the recovery in the housing market, a strategy at the heart of revitalizing the financial sector of the economy. Government debt is monetized when Treasuries are purchased by the central bank (the Federal Reserve). Or, put more simply, central banks monetize debt by printing more money. In recent weeks rising Treasury and mortgage rates have raised fears of inflation and rattled the financial markets. The yields on 10-year Treasury notes, for example, have risen from 2.5 percent in March to 3.7 percent on June 1. There has been a corresponding increase in mortgage rates, leading to a decline in mortgage originations, which previously had been booming. Today the Mortgage Bankers Association announced that the average contract interest rate for 30-year fixed-rate mortgages increased last week to 5.25 percent, a steep rise from 4.81 percent in the prior week. These interest rate hikes have occurred even though the Fed has been purchasing new issues of Treasuries and mortgage-backed securities, which were intended in part to keep down rates at a lower level than they might otherwise be. Bernanke gave his own explanation for why rates have risen. "These increases appear to reflect concerns about large federal deficits but also other causes, including greater optimism about the economic outlook, a reversal of flight-to-quality flows, and technical factors related to the hedging of mortgage holdings." Bernanke was referring, in part, to the fact that in the months following the global financial meltdown and freeze-up of credit markets that began in September after the failure of Lehman Brothers, funds flowed into U.S. Treasuries as a safe haven in a flight to quality. As markets have begun to function better and spreads come down, some of the money that flowed in to U.S. Treasuries has flowed out. In his remarks, the Fed Chairman summarized the deteriorating fiscal situation and the worsening outlook for even higher levels of debt. "The Administration recently submitted a proposed budget that projects the federal deficit to reach about $1.8 trillion this fiscal year before declining to $1.3 trillion in 2010 and roughly $900 billion in 2011," Bernanke stated. "As a consequence of this elevated level of borrowing, the ratio of federal debt held by the public to nominal GDP is likely to move up from about 40 percent before the onset of the financial crisis to about 70 percent in 2011," Bernanke testified. "These developments would leave the debt-to-GDP ratio at its highest level since the early 1950s, the years following the massive debt buildup during World War II," he added. Bernanke also spoke about expected huge increases in Social Security and Medicare spending as baby boomers retire. He cited the projections from recent trustees reports that outlays on these two programs will increase from 8.5 percent of the gross domestic product today to 10 percent in 2020 and 12.5 percent in 2030. As well, Bernanke defended the Fed against charges that its plan to purchase $300 billion in Treasuries represents an effort to monetize the debt. Bernanke described the Fed's plan to buy up to $1.75 trillion in assets April 3 and place them on the Fed's balance. The plan to purchase $300 billion in Treasuries was on the list of assets. At the time, the Fed had $490 billion in Treasuries on its balance sheet, Bernanke said. In addition to the $300 billion in Treasuries, the Fed is committed to buying $1.25 trillion in mortgage-backed securities issued by Fannie Mae and Freddie Mac, as well as $200 billion in debt issue by the same two government-sponsored entities. On January 13 Bernanke also defended the asset purchases as part of a "credit easing" program, which he differentiated from "quantitative easing." "Our approach -- which could be described as 'credit easing' -- resembles quantitative easing in one respect. It involves an expansion of the central bank's balance sheet. However, in a pure QE regime, the focus of policy is the quantity of bank reserves, which are liabilities of the central bank; the composition of loans and securities on the asset side of the central bank's balance sheet is incidental," he said. Even so, since early April the Fed's policy of purchasing $300 billion in Treasuries and other assets has been described by some as quantitative easing. Criticisms of the Fed's $1.75 trillion program to intervene to improve the availability and cost of credit have risen in recent weeks. German Chancellor Angela Merkel only yesterday rebuked central banks in the West for going too far in fighting the financial crisis. Viewing "with great skepticism the powers of the Fed," the European Central Bank and the Bank of England, she called for policy restraint in a speech in Berlin. "We must return together to an independent central-bank policy and to a policy of reason. Otherwise, we will be in exactly the same situation in ten year's time." An improvement in short-term funding, including the interbank lending markets and the commercial paper market. "Risk spreads in those markets appear to have moderated, and more lending is taking place at longer maturities," Bernanke testified. "The better performance of short-term funding markets in part reflects the support afforded by Federal Reserve lending programs." Relatively strong issuance of long-term bonds by nonfinancial firms and a narrowing of spreads between Treasury yields and the rates paid by corporate borrowers. Echoing themes that former Fed Chairman Alan Greenspan used to sound in his testimony, Bernanke briefly made his case for fiscal responsibility. "Addressing the country's fiscal problems will require a willingness to make difficult choices," he said. Striking a politically neutral note, Bernanke stated, "In the end, the fundamental decision that the Congress, the Administration, and the American people must confront is how large a share of the nation's economic resources to devote to federal government programs, including entitlement programs." Bernanke's message on taxes was two-fold. First, he was open to the idea of higher taxes with these comments: "Crucially, whatever size of government is chosen, tax rates must ultimately be set at a level sufficient to achieve an appropriate balance of spending and revenues in the long run." Yet, he warned that if tax rates are raised too high, it can be counter-productive. "In particular, over the longer term, achieving fiscal sustainability--defined, for example, as a situation in which the ratios of government debt and interest payments to GDP are stable or declining, and tax rates are not so high as to impede economic growth--requires that spending and budget deficits be well controlled," he stated. In closing his prepared comments, Bernanke promised to enhance the transparency of the Fed's credit and liquidity programs.